In a medium bowl, whisk the egg yolks until smooth. In a medium saucepan, combine the milk, cream, sugar, cornstarch and vanilla bean paste and whisk until smooth. Cook over moderate heat, whisking constantly, until the mixture comes to a gentle simmer and thickens, about 5 minutes. While whisking constantly, drizzle one-third of the milk mixture into the egg yolks. Slowly drizzle the egg yolk mixture back into the saucepan, whisking constantly. Cook over moderately low heat, stirring occasionally, until the mixture is very thick, 2 to 3 minutes. Whisk in the butter, then strain the custard into a medium heatproof bowl. Press a piece of plastic wrap onto the surface of the vanilla cream and refrigerate until cold, about 2 hours. Preheat the oven to 350°. In a small bowl, whisk the flour with the tea and salt. In the bowl of a stand mixer fitted with the paddle, beat the butter and sugar at medium-high speed until light and fluffy, about 3 minutes. Add the dry ingredients and beat at medium speed until well combined, 2 minutes. Press the dough into the bottom and halfway up the side of a 9-inch tart pan with a removable bottom. Refrigerate until firm, at least 30 minutes. Bake the crust for 20 to 25 minutes, until lightly golden. Transfer to a wire rack and let cool slightly. Set the crust on a baking sheet. Scrape the vanilla cream into the crust, spreading it evenly. In a medium bowl, toss the pears with the sugar. Arrange the pear slices in a slightly overlapping circular pattern over the cream. 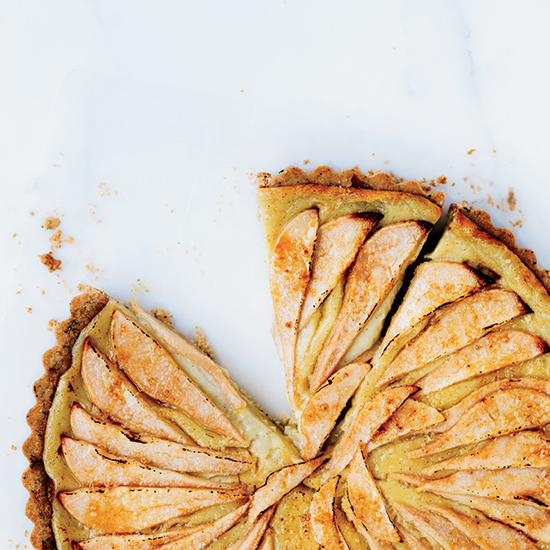 Bake the tart for about 30 minutes, until the pears are softened and golden. Transfer the tart to a rack to cool. Serve at room temperature or chilled.